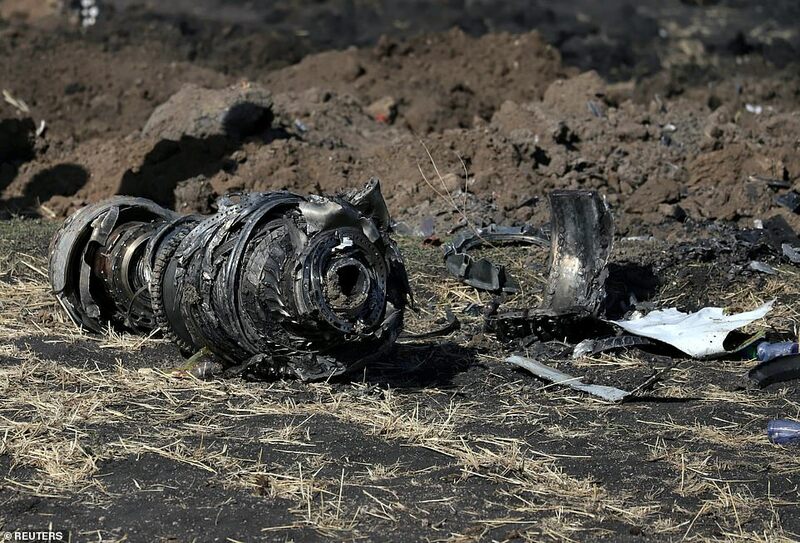 The doomed Ethiopian Airlines jet ‘had smoke pouring from the rear’ before coming down ‘with a loud boom’ in a crash which killed 157 people, a witness has said. 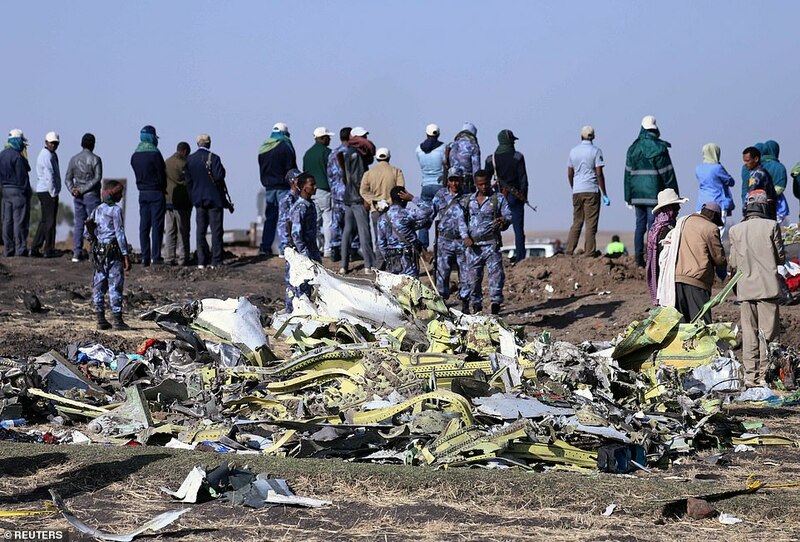 Gebeyehu Fikadu said he saw flight ET302 ‘swerving and dipping’ while ‘luggage and clothes came burning down’ when it crashed within minutes of take-off from Addis Ababa on Sunday morning. All 149 passengers and eight crew members on board the Nairobi-bound plane died in the disaster – the second involving a 737 MAX 8 in just five months. Last October, the same model of plane, operated by Lion Air, crashed in Indonesia, killing 189 people, and experts have highlighted the similarities between the two tragedies. The Boeing aircraft have been grounded in Indonesia, China and Mexico while U.S. officials said they would take ‘immediate action’ if they found safety flaws in the planes. Ethiopian Airlines, Cayman Airways and a private South African carrier have also taken the jets out of service. 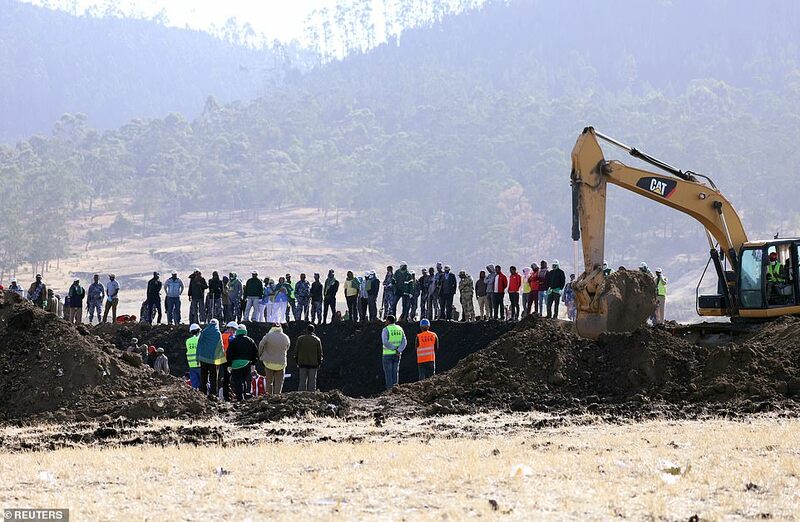 As Ethiopia marked a day of mourning and the search for remains entered a second day, rescuers said they had recovered the aircraft’s black box which is expected to shed light on the cause of the crash. In addition the number of British victims was revised up to nine on Monday after the Foreign Office discovered that some of them were dual nationals. 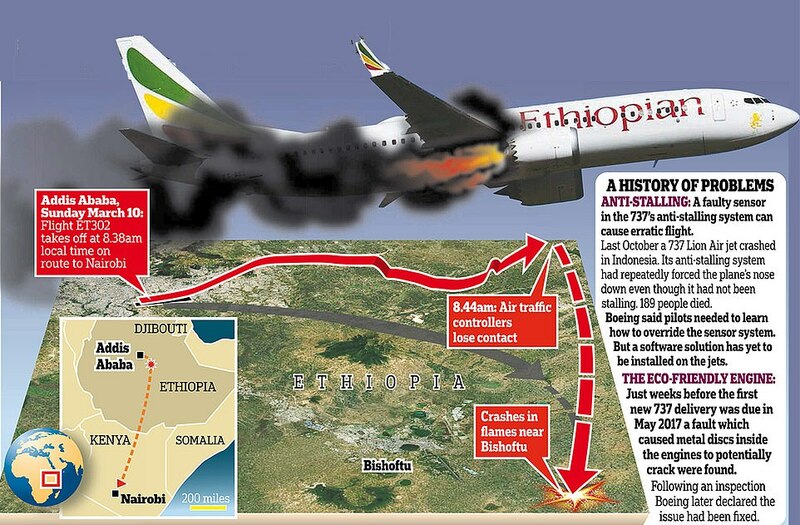 Crash witness Gebeyehu Fikadu, 25, told CNN he was collecting firewood nearby when he saw the plane ‘swerving’. He said: ‘I was in the mountain nearby when I saw the plane reach the mountain before turning around with a lot of smoke coming from the back and then crashed at this site. ‘It crashed with a large boom. When it crashed luggage and clothes came burning down. Malka Galato, the farmer whose land the plane crashed on, told Reuters he saw small items that looked like paper coming from the plane. The jet was making a strange noise and made a sudden turn just before it crashed, he said. Boeing said on Monday morning there was no need to issue new guidance to operators of its 737 MAX 8 aircraft based on investigations so far. But shares in Boeing Co slid nearly 10 per cent in early trading on Monday in one of the firm’s worst days on the stock market since 9/11. The firm had recovered about half its losses by the close of the trading day. Airlines in Brazil, China, Ethiopia, Indonesia, South Africa, Mexico and other countries said they were suspending operations of their 737 MAX 8 fleets. Pilots from Argentina’s Aerolinas Argentinas have refused to fly the aircraft. 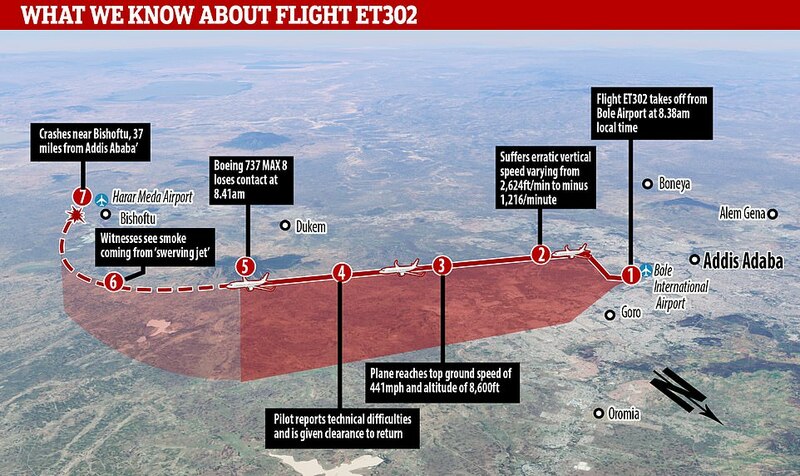 According to flight tracking websites, the ‘brand new’ jet took off at about 8.39am but crashed minutes later having climbed to 8,600ft and reached a ground speed of 383 knots (441mph). Data revealed the plane’s vertical speed – the rate of climb or descent – was ‘unstable’ and varied from 2,624 feet per minute to minus 1,216 within minutes of take off. The airline’s CEO said the pilot, who had 8,000 hours of flying experience, reported ‘difficulties’ and had asked for clearance to return to Addis Ababa before the crash. The MAX 8 is the latest version of the best-selling commercial jet in history and is operated by scores of airlines around the world – including in the UK. Boeing says it has taken more than 4,700 orders for the single-aisle family of planes which can carry up to 230 passengers. U.S. aviation officials had issued an Emergency Airworthiness Directive warning that pilots of Boeing 737-8 and 737-9 planes ‘could have difficulty controlling the airplane’ because of a problem with one of its systems. A faulty sensor could cause ‘excessive nose-down attitude, significant altitude loss, and possible impact with terrain’, the Federal Aviation Administration had warned. Previous Article Theresa May’s spokesperson has confirmed that the Prime Minister will write to Donald Tusk, the president of the European Council, to ask for a delay to Brexit.